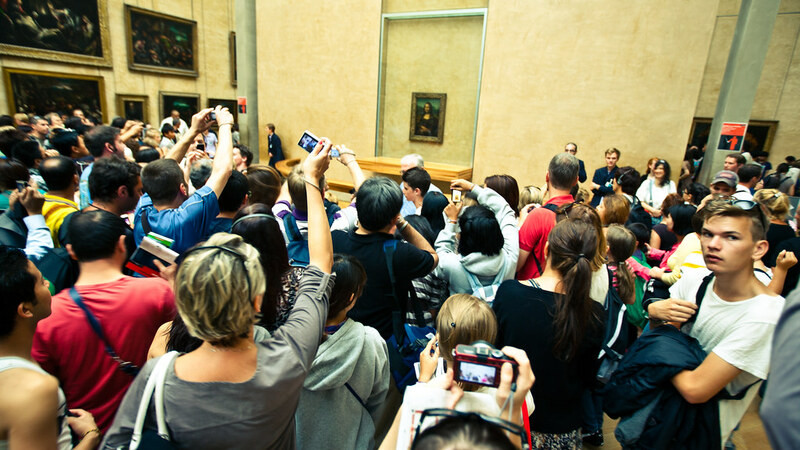 The Mona Lisa is intrinsically tied to France. Paris has claimed her as their own and rightfully so. Leonardo himself brought her to France when he went to work in the court of King Francis I. But Mona Lisa is not French at all. She’s Florentine. And while her portrait will likely never leave the Louvre, the shadows of her life can be found around every corner of Florence. Seems odd that Meg and I, two art history addicts who have been crafting themed walks of Florence for the past three years, wouldn’t have addressed this sooner, doesn’t it? Well perhaps for this very reason, Meg and I are extremely hesitant to “go there.” As any student of art history would tell you, the more you know about the Mona Lisa, the more you realize you don’t know. Leonardo’s masterpiece is a painting shrouded in mystery and surrounded by bickering scholars. For every “fact” that has been floated there is a corresponding contradiction. Therefore, some of you will likely find fault with this piece. That’s ok. This is not meant to be a scholarly evaluation of the Mona Lisa. Rather, it is an ode to the most likely candidate for the woman who has beguiled the world for half a millennium – Lisa Gherardini. “So what is the deal with the Mona Lisa?” This is the most common question I receive when someone finds out I studied art history. No, I don’t scoff. It’s a completely valid question. She is arguably the most recognizable face in art history. Why does the world fawn over this 3′ x 2′, murky painting — an image that likely wouldn’t even make it to Instagram by today’s standards? So my answer? Well there are a few basics that give her a competitive edge in art history books. With an extremely limited oeuvre of paintings, any Leonardo da Vinci is going to be a big deal. She sets the tone of portraiture pretty much for the rest of time. Just look at every portrait done before and after her. There is a very notable shift. Those eyes, that smile. In the 15th century…well she might as well be flashing the audience. Ok, she’s important, but why is she so important? I don’t entirely know, but I can tell you why she captivates me. Meg and I were lucky enough to study under Rab Hatfield, a leading scholar in Renaissance Art. Our course coincided with Professor Hatfield’s final lap on writing his recent book, The Three Mona Lisas. Each week we dissected every last detail of the painting, every lingering question, every brushstroke, every documentation of her existence. Her story told like something of a whodunnit? Each time my classmates and I thought we had her pinned down – who she was, when she was painted, why she was painted, what she was wearing, a wrench was thrown in that crushed our theories. The course reached its climax one Monday afternoon in the laboratory of Maurizio Seracini. If you are a Dan Brown fan the name may ring a bell as Seracini is the only real character in Brown’s fictional series. Seracini founded Italy’s first company for non-destructive analyses of art and architecture. A most notable project of Seracini’s was the analysis of the Mona Lisa. After an hour and a half of flipping through high-resolution images of the portrait Seracini finally landed on an infrared. The image revealed an earlier portrait of a slightly different woman painted underneath the Mona Lisa we know today. Ringing any bells? Earlier this December (2015) news came from France that French art expert, Pascal Cotte, had discovered a second painting underneath the Mona Lisa. Huh? My reaction too. My classmates and I had seen the second painting with our own eyes four years prior. Regardless of who found the portrait first, the fact remains — Leonardo da Vinci literally added another layer to the mystery of the Mona Lisa and the press release from France has brought Lisa’s snarky smile back into our lives once again. Da Vinci may just have written the best mystery of all time – one whose evidence is still surfacing nearly 500 years after his death. Who were these women in the paintings? Why would Leo mess with perfection? The most likely explanation is that through Leonardo’s career — working in Rome, Milan, Florence, and Paris — the canvas remained by his side. He probably re-worked the canvas — possibly with a portrait of someone else, possibly working from his memory of Lisa, or possibly creating a woman of his own invention. So one answer leads to more questions. While we are still working through countless questions about the painting, we are relatively confident in saying that at least one of these portraits (if not both) depicts Lisa Gherardini of Florence. Although our course with Prof. Hatfield concluded with the case of the Mona Lisa’s identity wide open, Diane Hales reported that Hatfield recently discovered a letter in the archives of Florence that supports our suspicion that the smile does indeed belong to Lisa Gherardini. While Lisa Gherardini’s face is perhaps one of the most recognizable in history, few could tell you who she really was, where she lived, or how she lived. Countless books have been written about the mysterious painting, but few have addressed the woman who smiled for Leonardo until Diane Hales’ recent book, Mona Lisa: A Life Discovered (highly recommend). Instead of taking a crack at the Mona Lisa mystery (we have enough pros working on that one) we are simply going to try and better understand what exactly it was that made Mona Lisa smile the best way we know how — a walk! 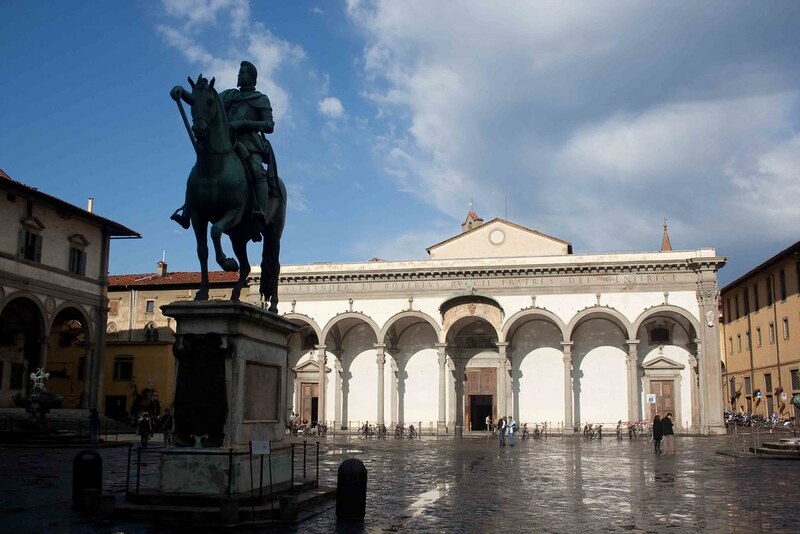 Today we will explore the shadows of the life of Lisa Gherardini in the streets of her home – Florence. Our walk begins in the quiet neighborhood of the Oltrarno. On the corner of Via Sguazza and Via Maggio sits a palazzo, much like any other in Florence. You’ve likely zipped by this agnolo on your way to Gusta Pizza (at least I have) or stood with your back to it as you admired the intricate frescoes on the façade of the house of Bianca Cappello across the street. However, just behind you is the first home and birthplace of the sitter for the most famous portrait of all time — Lisa Gherardini. She was born 1479 to what more or less would be considered an “upper middle class” family in Florence. The Gherardini’s clung tightly to their noble last name as their bank account dwindled. Like all Florentines, Lisa was baptized in Florence’s Baptistery. While we may not surprised by this, it is notable as Lisa’s baptism record is one of the only official records of her existence. Lisa would have strolled and skipped down Via Ghibellina as a young girl when her family moved to rented rooms in the palazzo of her grandparents. Just steps down the street lived a certain Piero da Vinci — that’s right, Leonardo’s dad. Florentines were all about the Benjamins... I mean Florins. Aside from making your way in the cutthroat Florentine business world, the next best way to fill the bank account was by marrying your money – aka a woman with a sizable dowry. Coming from a family that was noble in name only, Lisa’s dowry wasn’t exactly eye-catching to young suitors. Her looks, however, were. Francesco del’ Giocondo, a social climbing cloth merchant, took her as his third wife when she was only 15 years old (he was 30). The two lived near San Lorenzo on Via della Stufa. This home would have been the intended destination of the famous portrait of Lisa. One of our many Mona Lisa theories is that Francesco commissioned the portrait from his friend Leonardo on the occasion of his daughter’s birth. Or was it to celebrate moving into their new home? Or perhaps for the purchase of a new puppy? No one really knows, but we can assume that the portrait would have adorned the walls of Via della Stufa 23 if it had ever made it there. While working on the Mona Lisa, Leonardo was distracted by a very shiny new commission — a fresco competition with Michelangelo in the Sala Grande of the Palazzo Vecchio (another Leo mystery for another day). As you visit the residence, imagine the life of the young mother, caring for five children, witnessing the golden age of the Renaissance rise around her at the turn of the century, the fiery movements of Savonarola churn in the streets below, and the rise of the Medici Duchy. Lisa lived the defining years of Florence. **Lisa’s husband’s surname (Giocondo) lends itself to the more popular name for the portrait in France — La Gioconda or La Joconde. Francesco’s last name meaning “happy” made for the perfect play on words for the smiling woman in the portrait. In Italian La Giocanda translates to the happy woman. Even as Lisa aged, her beauty turned heads. Ok, so we might not be into the no eyebrow and plucked hairline thing today, but back in the day she was a real dime piece. How do we know this? A comical letter between the equivalent of two Florentine players (Filippo Strozzi and Lorenzo di Piero de’ Medici) recounts that both made a pass at the beautiful Lisa Gherardini despite her marital status and age (significantly older than their own). The letter then details how Francesco came to find out about the failed passes at his wife. Upon discovering the news, Francesco confronted Filippo. However, rather than picking a fight, the social climbing Francesco apologized that his wife was so disrespectful as to turn down the noblemen. Needless to say, Filippo and Lorenzo got a good LOL out of it. It seems strange that two noblemen would think they had a shot with a married woman, right? Well perhaps the notorious reputation of her sister had something to do with that. On Via Luigi Salvatore Cherubini, between Via Venezia and Via Pier Antonio Micheli lies a garden behind an iron fence. Now a favorite hangout of the stray cat population of Florence, this compound is the former Domenico di Cafaggio convent where Lisa’s sister, Camilla, lived as a nun. One evening a eager bunch of sexually repressed young men broke out a few equally adventurous sisters from the convent. To keep our blog PG, let’s just say a series of group activities occurred that would have absolutely made the cover of Renaissance Florence Inquirer if such a thing existed (I like to think it did). Needless to say, the Gherardini family wasn’t thrilled that Camilla was a named participant. Paying a visit to Santissima Annunziata is paying a visit to some very important people in Lisa’s life – her husband Francesco and two sons are interred in the Gherardini family chapel inside the church. The burial site of her sons would become more prominent in recent years as excavations and DNA tests in attempts to find the body of Lisa Gherardini have become of interest (we’ll get to that later). But in the Gherardini family chapel there is a notable absence – Lisa herself. Tucked behind the bustling Mercato Centrale is Via Sant’ Orsola. No, this street is not quaint, or charming, like most streets in Florence. The adjectives seedy and sketchy seem more appropriate for this city block. 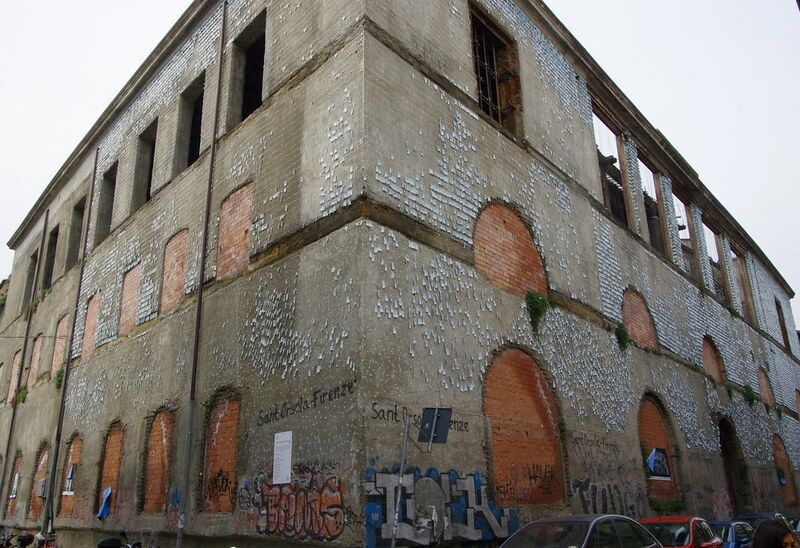 The compound to your west appears to be abandoned, windows bricked up and graffiti rampant on its walls. This is the former convent of Sant’ Orsola and the final home of Lisa Gherardini. After her husband’s death, pious Lisa took up residence in the convent where her daughter Marietta was a nun. She died here in 1542 at the age of 63 and was buried in its walls. As the Mona Lisa exponentially grew in fame and attention, the real Lisa quietly faded away. The convent closed, a few businesses moved in and out, and eventually the property was abandoned entirely. Lisa’s legacy was left in a forsaken convent in a forgotten corner of the city. In 2012 excavations of the grounds located the probable grave of Lisa Gherardini. Sadly, but not surprisingly, her bones were found in disarray – crushed, broken, and missing a skull entirely. Due to the state of her grave, archaeologists were unable to definitively identify the body, but historians have substantial evidence to believe that in the ruins of this convent, they have found the true Mona Lisa. The woman behind the most famous portrait of all time came to a very anti-climatic ending. She faded into oblivion as her image rocketed to art history super-stardom. While some may find the quiet life of Lisa Gherardini underwhelming, I find that it draws me into this portrait more than ever before. Although her biography avoids the limelight and dances away from scandal, I appreciate her as a real woman. A woman who simply strove to live a pious life as a good mother and a faithful wife. Although there are a million arguments, I like to believe that the Mona Lisa celebrates not a queen, not a male fantasy, not a goddess, but a real woman. And that, is why I ultimately think that the Mona Lisa is a big deal. What a wonderful article! I just read Dianne Hales’ book and loved it. Really wonderful piece. We don’t read all of every entry since Firenze isn’t in our current plans, but we take a look at each one, and really enjoyed this. Y’all do a great job. Keep it up. Felice anno nuovo. Enjoyed reading this story so very much…it answers many of my questions! Thanks Dorothy! Glad you enjoyed. The Mona Lisa is so fascinating! If you liked this you should continue reading about the painting – this only scratches the surface! What happened to you all. I have missed the weekly posts so much. Can I follow you on a new project you are working on?